Last Saturday evening I finished my gingham quilt!!!! I waited until I completed the coordinating pillowcases (all 6 of them!) to put the quilt on the bed. Otherwise I would procrastinate for at a least a year or two to actually sew them up. Ha! I put everything on my bed last night and I'm soooo pleased with how it all came together! The quilt uses only 5 fabrics: White, Pink Flamingo and Pearl pink (all Konas) for the top. The binding (lotta dots in coral reef) and backing (apron in coral reef) fabrics are from Connecting Threads. That coral color is super hard to photograph, but trust me, it's really pretty! It was pretty fun to back an entire quilt with my fabric. :) This is my largest quilt to date, finishing at about 108" x 102". I'm very happy that this quilt, which features the Kona color of the year, is actually finished before the year is over. Woohoo! You did it! I love the ridge formed by the quilted loops. Fantastic quilt! Pretty! I like the secondary horizontal/vertical lines that show up in the first photo from the way the light hits the quilting. 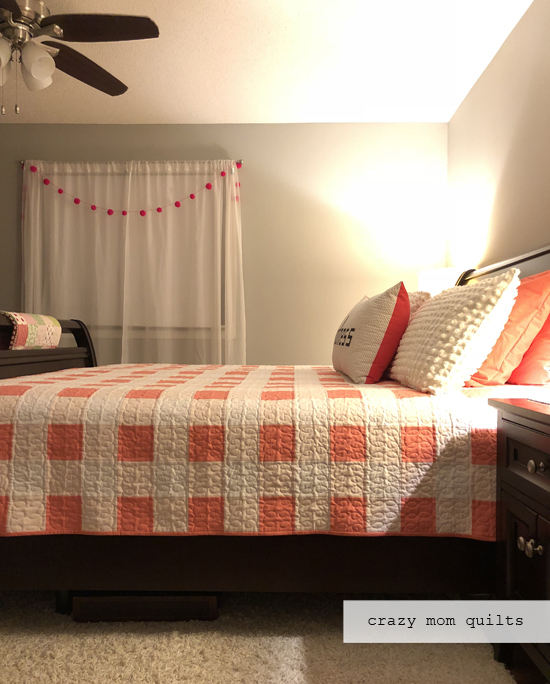 I absolutely love the gingham quilt! Great job! Love the pillows too and the circle garland on your window! Your quilt looks great on your bed. Congratulations on a sweet finish! Brilliant idea to have the pillows ready for the bed, too. It looks wonderful; congratulations on a new bed quilt! It’s beautiful and I love the quilting! Beautiful quilt! You did great!!! Gosh, that's huge! Congratulations on a big finish! Great finish on your Quilt. Yes that colour is hard to get good photos of it. I hope next week you will show off your pillows. cool -- isn't sleeping under your own quilt just too cool! Congratulations, it's big and beautiful. Oh so pretty! Congrats on the finish complete with matching pillow cases! Goodness! that quilt looks stunning on the bed! Beautiful finish. This is very pretty and the pillows are definitely a great finishing touch. Love the quilting. Did you do this yourself? 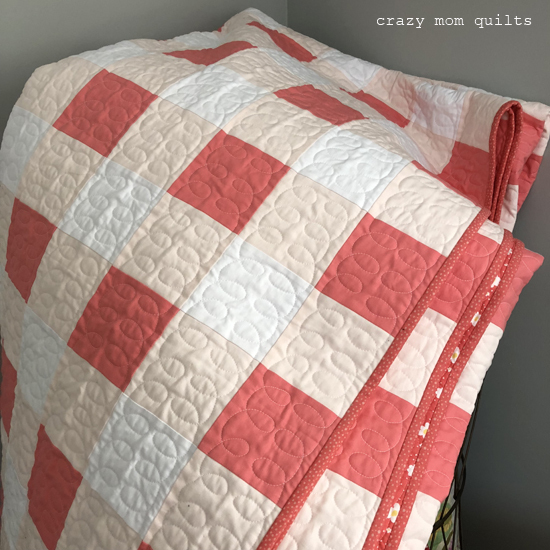 I have now added a gingham quilt to my list of projects I someday want to complete! Good job! oh this looks so awesome, especially with your coordinating pillows! if Any one want New Embroidery Designs ? I really like the texture of your quilting. That was so smart to finish it up with the pillow cases while you still had the fabric out. You have created a beautiful bedroom ensemble. I finished three table runners. Two for for a fundraiser at my church and one will be a gift love your quilt. You should be pleased...that bedroom is beautiful and just made me smile!! I love you gingham quilt. The colors are so pretty and I like the simplicity of the quilt. What an awesome finish for you!!! The gingham quilt is so pretty and the 6 pillows complete the set!! Well done and I hope you pat yourself on the back!!! Sometimes simple is oh so very beautiful! Especially when done in such pretty colors. Love the little dingle balls on the window too. I'm curious about whether you use Connecting Threads thread for piecing and quilting? Oh Wow!! Your quilt looks fabulous!! And i love the spot of colour you added at the window. Beautiful! ohhh ahhhh! It looks beautiful, perfect with the cushions. 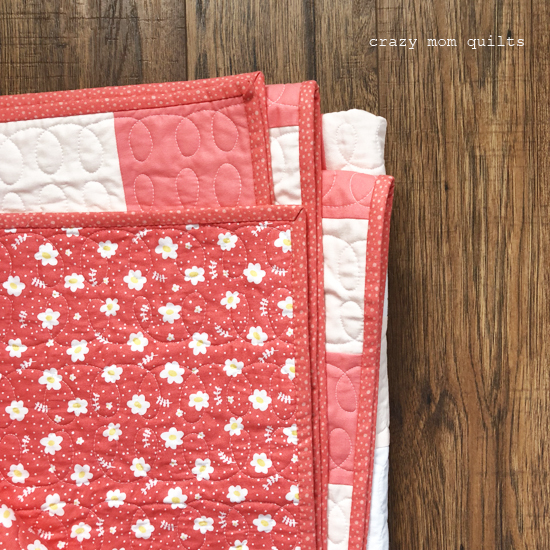 Gingham is so classic and I love love love the quilting! As others have said, I love the 'cabling' that has shown up directly in the middle of the squares. It looks so inviting. What a beautiful ensemble. I'm not a big pillow person, but those look great! Such a simple pattern, yet stunning! Love it! Amanda your gingham quilt is inspiring. Where would the pattern be available? Would it be too much to take on as a first time quilter? Oh, my goodness, it looks gorgeous! I love the simplicity of this room - like country, meets Scandinavian, meets modern! The quilt is lovely.. I'm also drawn to the pom pom garland. Did you make this? If so, do you have instructions somewhere or a pointer to a "how to"? Thanks!